Worcestershire County Council’s programme of improvement works to relieve congestion on the A38 in Bromsgrove is due to begin later this month. The County Council is working with partners Highways England, Bromsgrove District Council, Worcestershire Local Enterprise Partnership and the Greater Birmingham and Solihull Local Enterprise Partnership to deliver the programme. 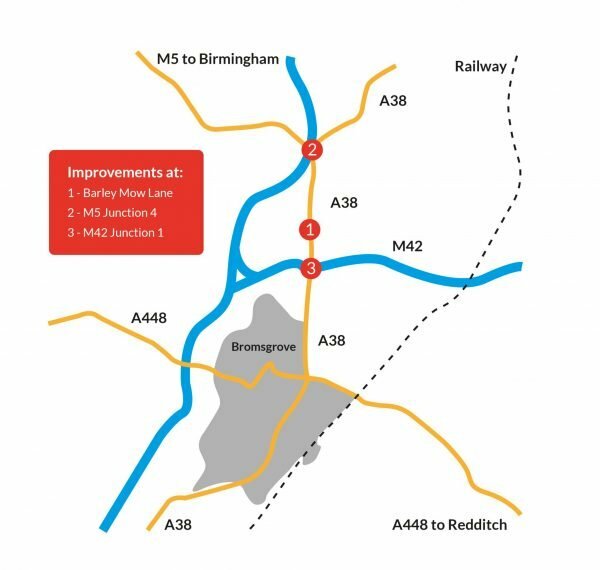 The first phase of works includes improvements in 3 key locations: Barley Mow Lane, M5 Junction 4 and M42 Junction 1. The first of these locations to see improvements is the junction of the A38 with Barley Mow Lane. This part of the scheme includes the provision of a dedicated right turn lane for southbound A38 traffic wishing to turn into Barley Mow Lane. The lane will help to prevent through-traffic being held up by traffic waiting to make the turn. To make room for the right turn lane, the existing pedestrian crossing will be moved slightly further north and the bus stops will be moved a few metres from their current locations. There will also be some improvements to street lighting between Barley Mow Lane and Hazelton Road as part of the scheme. Work will begin on site during the week commencing 22 April and will require some lane restrictions, narrowing the lanes on the approach to Barley Mow Lane. In late May, a number of overnight closures will be needed for resurfacing. The exact timings of these will be confirmed approximately 2 weeks before the closures. There will also be a small number of days when temporary traffic signals will be in use during off-peak hours, however this will be kept to a minimum. To stay up to date with when the closures will be in place and for further information, visit the Worcestershire County Council website and follow the Council’s dedicated travel twitter feed @worcstravel.